In parliamentary systems fashioned after the Westminster system, the prime minister is the presiding and actual head of the government and head of the executive branch. In such systems, the head of state or the head of state's official representative (i.e. the monarch, president, or governor-general) usually holds a largely ceremonial position, although often with reserve powers. When the monarch grew tired of a first minister, he or she could be dismissed, or worse: Cromwell was executed and Clarendon driven into exile when they lost favour. Kings sometimes divided power equally between two or more ministers to prevent one minister from becoming too powerful. Late in Anne's reign, for example, the Tory ministers Harley and St John shared power. A tipping point in the evolution of the prime ministership came with the death of Anne in 1714 and the accession of Hanover, and had neither knowledge of, nor interest in, the details of English government. In these circumstances it was inevitable that the king's first minister would become the de facto head of the government. Walpole always denied that he was "prime minister", and throughout the 18th century parliamentarians and legal scholars continued to deny that any such position was known to the Constitution. Benjamin Disraeli but did not appear in the formal British Order of precedence until 1905. By the late 20th century the majority of the world's countries had a prime minister or equivalent minister, holding office under either a constitutional monarchy or a ceremonial president. The main exceptions to this system have been the United States and the presidential republics in Latin America modelled on the U.S. system, in which the president directly exercises executive authority. This contrasts with the presidential system, in which the president (or equivalent) is both the head of state and the head of the government. In some presidential or semi-presidential systems, such as those of France, Russia or South Korea, the prime minister is an official generally appointed by the president but usually approved by the legislature and responsible for carrying out the directives of the president and managing the civil service. The head of government of the People's Republic of China is referred to as the Premier of the State Council and the premier of the Republic of China (Taiwan) is also appointed by the president, but requires no approval by the legislature. However as the government will have to outline its legislative programme to parliament in, for example, the Speech from the Throne, the speech is sometimes used to test parliamentary support. A defeat of the Speech is taken to mean a loss of confidence and so requires either a new draft, resignation, or a request for a dissolution of parliament. Until the early 20th century governments when defeated in a general election remained in power until their Speech from the Throne was defeated and then resigned. No government has done so for one hundred years, though Edward Heath in 1974 did delay his resignation while he explored whether he could form a government with Liberal party support. During the period between the time it is clear that the incumbent government has been defeated at a general election, and the actual swearing-in of the new prime minister by the monarch or governor-general, that person is referred to as the "prime minister-elect" or "prime minister-designate". Neither term is strictly correct from a constitutional point of view, but they have wide acceptance. In a situation in which a ruling party elects or appoints a new leader, the incoming leader will usually be referred as "prime minister-in-waiting". An example or this situation was in 2003 in Canada when Paul Martin was elected leader of the Liberal Party of Canada while Jean Chrétien was still prime minister. 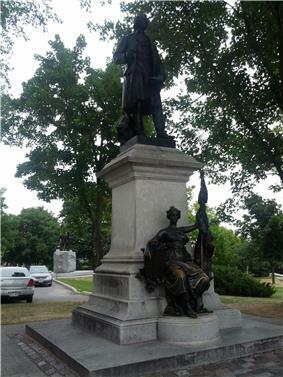 Statue of John A. Macdonald (1815–1891), first Canadian prime minister. Australia's constitution makes no mention of a Prime Minister of Australia. India's constitution (1950) lists the powers, functions and duties of the Prime Minister of India. Italy's constitution (1948) lists the powers, functions and duties of the Prime Minister of Italy. The United Kingdom's constitution, being uncodified and largely unwritten, makes no mention of a prime minister. Though it had de facto existed for centuries, its first mention in official state documents did not occur until the first decade of the twentieth century. Accordingly, it is often said "not to exist", indeed there are several instances of parliament declaring this to be the case. The prime minister sits in the cabinet solely by virtue of occupying another office, either First Lord of the Treasury (office in commission), or more rarely Chancellor of the Exchequer (the last of whom was Balfour in 1905). In the Russian constitution the prime minister is actually titled Chairman of the government while the Irish prime minister is called the Taoiseach (which is rendered into English as prime minister), and in Israel he is 'Rosh HaMemshalah' meaning head of government. In many cases, though commonly used, "prime minister" is not the official title of the office-holder; the Spanish prime minister is the President of the Government (Presidente del Gobierno). The Prime Minister's executive office is usually called the Office of the Prime Minister in the case of the Canada and other Commonwealth countries, its called Cabinet Office in United Kingdom. Some Prime Minister's office do include the role of Cabinet. In other countries, its called the Prime Minister's Department or the Department of the Prime Minister and Cabinet as for Australia. First of all [the Prime Minister must listen a lot, and when deep disagreements occur, he must suggest a solution to the matter. This can be done in different ways. Sometimes during the discussion, I note the elements of the problem and think of a proposal I can formulate to the Council (cabinet), the Secretary taking notes. The Ministers then insist on changing game ages. The Prime Minister can also make a proposal which leaves enough room for amendments in order to keep the current discussion on the right tracks. When a solution must be found in order to reach a consensus, he can force one or two Ministers to join or resign. 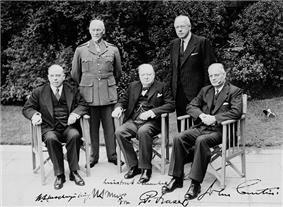 ^ "Privy Council Members". The Privy Council Office. Retrieved 19 Sep 2009.